Curator-historian Peter Emmett invited me to provide a range of services toward the major refurbishment of this internationally unique museum. Artist Fiona Hall was commissioned to create a permanent feature artwork for the project. This comprised a large custom-built cabinet incorporating a variety of display techniques to explore aspects of tradtional uses of wood and timber. Having worked with Fiona on previous projects for the Adelaide Botanic Gardens, she invited me to edit a series of twin-screen quicktime video sequences from footage she shot during residencies at the Geoffrey Bawa estate, Lunaganga, in Sri Lanka. The completed work sequentially documents traditional hand-milling of the jak tree (Artocarpus heterophyllus). The screen is embedded in the showcase and commences playback whenever a visitor walks nearby. Sound is delivered via a speaker attached to a hardwood timber panel in front of the screen, giving a sense that the timber-milling sounds of rhythmic sawing, saw-sharpening, etc are emanating from the timber structure. Two screens display media inside two different showacases in the exhibit – the Introduction showcase, and another exploring uses of timber by Australian Aboriginal people of the central deserts. 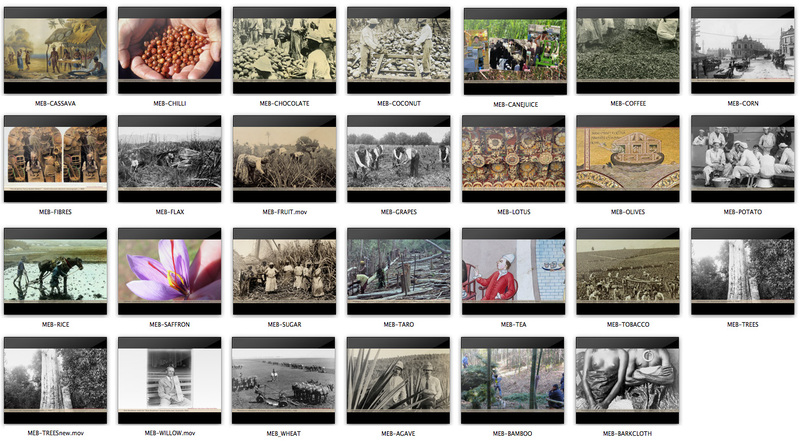 For the Introduction screen, I researched and produced a series of 30 single-theme photo-essays exploring subjects such as Coffee, Sugarcane, Bamboo, Flax, etc. Most sequences combined archival photography with contemporary images sourced from flickr users. Each image slowly moves on screen and is accompanied by a text-strip description. The work explores the broad diversity of human uses of botany, acorss time and space. South Australian Museum provided an approved set of images for use in the showcase about Aboriginal uses of timber. These images are displayed on a simple digital photo-frame, with accompanying text descriptions. I worked closely with Peter Emmett on his production of the 186pp souvenir catalogue, assisting with editing, proof-reading, writing an essay, and providing original photography including installation shots and a sequence of 30 still-frames from Fiona Hall’s ‘Grove’ video.